Last November I reviewed "The Making of Some Like It Hot" by Tony Curtis. That book chronicled the making of a movie that broke box office records and set the stage for a new and more liberal type of comedy. This still shot, taken from the movie, shows Mr. Curtis, in character as Josephine, aka Joe, with Jack Lemmon, sans wig, as Daphne, aka Jerry, in one of the hotel room scenes. Yesterday evening at 9:25 PM, Mr. Curtis passed away at his home in Las Vegas, Nevada. He was 85 years old and his film career spanned 6 decades. During this time he played a slave in "Spartacus", a fugitive chained to fellow escapee Sidney Poitier in "The Defiant Ones", and a spineless gofer opposite Burt Lancaster in "The Sweet Smell of Success." The entire index of his films would be too long to list here. Married at one time to Janet Leigh, he was also the proud father of actress Jamie Lee Curtis. You might say that acting ran in the family. There is not much that I can cover here which you will not read in today's papers, or hear on the news. So I thought I would re-run a review of Mr. Curtis' hilarious and insightful book about the fiming of the classic "Some Like It Hot", which I reviewed here last November. Mr. Curtis is one more of the "old" Hollywood crowd that seems to grow thinner with each passing year. Thanks, Mr. Curtis for some wonderful movies, and for this very entertaining book about a landmark film. This is a delightful book. "Some Like It Hot" has long been a favorite of mine and to get a glimpse behind the scenes through the eyes of one of the principal actors is a treat! Mr. Curtis spares nothing in his recollections of the filming of one of Hollywood's best loved masterpieces. There is a little bit of "kiss and tell" here, but not too much. The book is more a narrative of what it was like working with the creative genius of Billy Wilder. The book is filled with anecdotes and tidbits of information about not only the movie but Hollywood itself. The rift between George Raft, who plays one of the gangsters, and Edward G. Robinson is explored. This goes back to the filming of "Manpower" with Robinson and Raft as Linesmen in love with the same woman, Marlene Dietrich. In reality they were both smitten with her and came to blows on the set. There was a Life photographer there who got it on film. Due to this , Robinson turned down the part to play opposite Raft in "Some Like It Hot." The parts of the book that are the most entertaining involve Tony Curtis and Jack Lemmon learning how to dress and act like women. 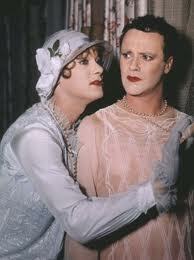 The big surprise for Mr. Curtis was how well Jack Lemmon adapted to the role. He revelled in it! The creative process is explored extensively. Billy Wilder never made a film with a complete script. He would film what he had and then rewrite or revise as necessary. This gives his films the spontaneity they are known for. Filled with photographs from the studio and some of the authors own collection this book is a great read for holiday travel. The color photos are a real treat as the movie was shot in black and white. The freindship between Marilyn Monroe and Tony Curtis is beautifully expressed. This will be of interest to all Monroe fans. He has a unique ability to let you peek inside without being sleezy. He obviously recognizes Marilyn Monroes faults but also gives her credit for the complex and sensitive person she was. Originally I picked this off the shelf as a quick selfish read. It turned out to be so much more than that. I'm glad I took the time to look behind the magic of the movie and see how it was accomplished.